As a teacher with a classroom full of laptops, I had to read the article in my Twitter feed entitled–“Ban the Laptops, Yes.” This article by Mark Bauerlein cites a study that appeared in Education Next, under the title “Should Professors Ban Laptops?” which suggests that the implementation of classroom technologies, such as laptops, may be detrimental to student learning. will produce higher student achievement. 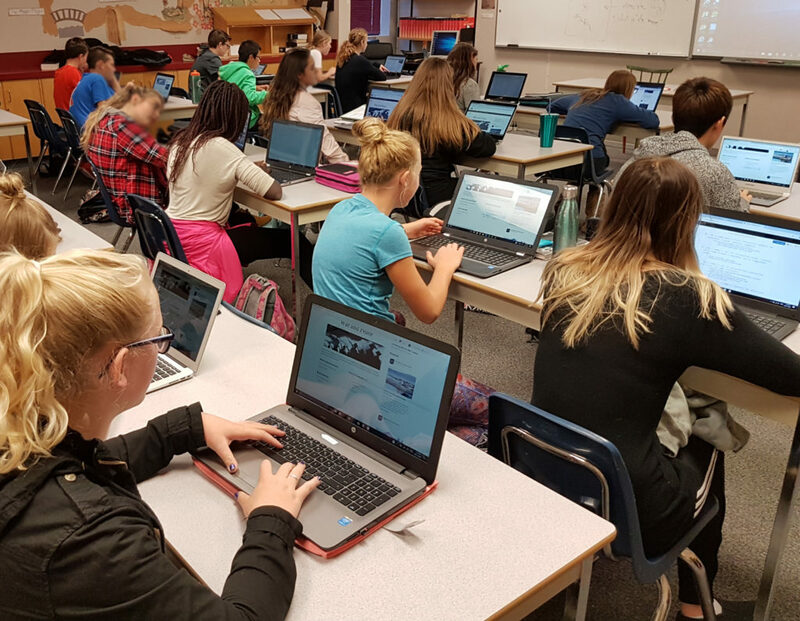 I was troubled and confused–troubled because last year the high school at which I teach required every student to come to school with a laptop, confused because, from my experience, laptops are improving student learning. I read a little further. The article explains, “The decisive measure was performance by students on the final exam.” Ah, there it is. I was no longer troubled or confused. Why are laptops a detriment to student learning, but an indispensable tool for the professors who deliver the lectures, and research and publish their papers, articles, and books? In the so-called, “real world” personal computers and other digital devices are used by adults all the time–presumably because they are effective tools for accomplishing important tasks. Is it simply that adults are more mature and therefore better able to resist the temptation to watch Youtube videos? Or is it because the work that adults are doing is relevant and the results really matter, and because the work is challenging, requiring creativity and critical thinking? Is it because it’s personal–involving the whole person–the unique gifts and abilities of the adult individual? Or is it because it’s interpersonal, involving collaboration with others? Is it because it’s complex, varied–interdisciplinary? Or is it because the responsibility for the success and failure of our efforts rests heavily on our shoulders? Perhaps the problem is not the laptops, but a pedagogy that lacks all of the things that keep adults motivated to do good work. In my grade 9 humanities class, we are studying World War I. One of the students’ tasks is to produce several documentary videos telling the story of the First World War–the causes, key figures and events, and the effects. Their laptops are vital tools in this project. They research their topics using the internet. They write and edit the script for their documentary film using a word processor. They find out how to properly cite their sources using online resources. They record their scripts, then create and edit videos on their laptops. In the process, they give and receive feedback as to how to improve their documentaries. They then share these videos on a social media platform so that others may learn from their work. The use of technology isn’t to make learning about WW1 more fun, nor is it a distraction from the learning. It is a vital tool in the process of completing a complex project where students learn, not only about World War 1 but about research, primary and secondary sources, how to discern internet sources, documentary script writing, plagiarism, providing feedback, voice recording, video editing, and a lot more. Students are not passive; they are active and motivated to complete a project of high quality–they don’t have time to check in on their social media accounts. For a student passively listening to a lecture, it’s almost impossible to resist the lure of the distractions. What is the problem here? Are the laptops the issue? But if your students transform, rather than transfer information; if the boundaries between your classroom and the “real world” are blurry; if what your students are learning will have relevance 30 years beyond the exam. . .
then bring in the laptops!